You may recall the live, GRAMMY Award-winning project from more than a decade back focused around the Last of the Great Mississippi Delta Bluesmen, featuring the music of Robert Lockwood Jr., David Honeyboy Edwards, Pinetop Perkins, and Henry Townsend. While all of those artists have long since passed, a just-released documentary shows that there are still at least a few Delta greats remaining, even if some of them may not now or ever be household names. 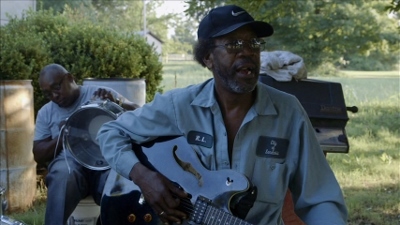 Following recent GRAMMY Award-winning blues harmonica player and singer Bobby Rush — a Louisiana native — across Mississippi and Louisiana, I Am the Blues (Film Movement) also features a number of other Delta-born or -based blues musicians, including Leo “Bud” Welch, Lazy Lester, LC Ulmer, Barbara Lynn, RL Boyce, Carol Fran, Lil’ Buck Sinegal, Jimmy “Duck” Holmes, and pianist Henry Gray, most of whom were already in their 70s or beyond at the time of filming, with some having been performing since as far back as the 1950s or 1960s. 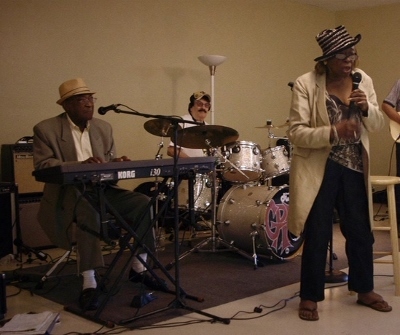 Directed by Canadian filmmaker Daniel Cross, the nearly two-hour documentary captures the musicians performing at various juke joints, community shows, backyard barbecues, churches, front porches, and more, as well as being interviewed on their careers, love of the blues, and topics such as race, blues in the church, and the devil in music. 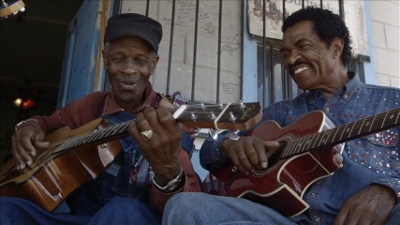 Bobby Rush talks about the chitlin’ circuit and getting paid (and paying his band, including his guitarist Freddie King) in the form of hamburgers; Henry Gray remembers Howlin’ Wolf; RL Boyce recalls playing with the likes of Bobby “Blue” Bland, Albert King, Little Milton, and Jessie Mae Hemphill; and Little Freddie King harkens back to his childhood and building a cigar box guitar. But the real treat here is getting to see and hear these musicians play, many both solo as well as along with some of the others, including, for example, Rush and Gray doing a “Lucky Lucky Man”/”Ain’t That Just Like a Woman” medley: Gray and niece Carol Fran doing “Rock Me Baby”; Gray, Fran and Lester with “Stagger Lee”; Gray, Rush, Lester and Sinegal on “Sweet Home Chicago”, and Holmes and Rush on the closing “So Long Blues”, along with a variety of pairings that take place on the front porch of the Blue Front Cafe — a Bentonia, Mississippi, blues club that Holmes has run for more than 40 years — such as an “I’ll Fly Away” from LC Ulmer, Little Freddie King, and McKinney Williams, the latter being a new name to us, but someone we will definitely be looking into after hearing him perform his slow, powerful original “Tennessee” just prior to the group number. 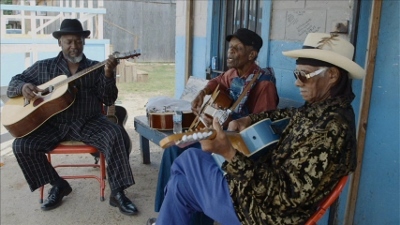 The film also includes such familiar songs as “Hard Time Killin’ Floor Blues”, “Forty-Four Blues”, and “Devil Got My Woman”, as well as some killer tracks from Barbara Lynn in her groovy “It’s Been So Long” and Lil’ Buck Sinegal in the Cajun-flavored “I Got Loaded”. And just try to hold yourself back from enjoying the breezy freedom of Sinegal’s “Winding Roads and Pine Trees”! 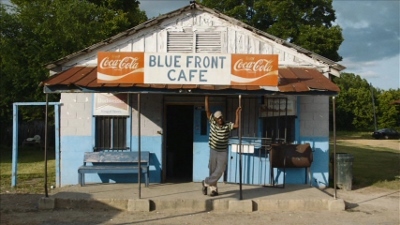 All but a few of the songs heard are performed live by the artists featured, with Bobby Rush’s “Tight Money” and a few Skip James numbers (the closing credits’ “Crow Jane” as well as original versions of “Hard Time Killin’ Floor Blues” and “Devil Got My Woman”, both also performed by Holmes during the film) being perhaps the sole exceptions but fitting in quite seamlessly with the rest of the soundtrack. 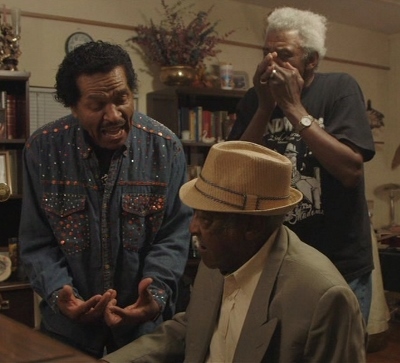 A somewhat poignant (especially, for example, when Holmes responds that “nobody seems interested” in playing the music after he’s gone) and completely genuine look at an important generation of blues musicians, I Am the Blues allows us to hear from and see several late artists (Ulmer and harmonica player Bud Spires both died in early 2016) and a cadre of others who may all too soon be gone. Numerous times throughout the film we catch Rush listening intently and respectfully to the other musicians as they play, a similar effect we’re sure as to what many viewers of the documentary will experience as they watch in theaters. 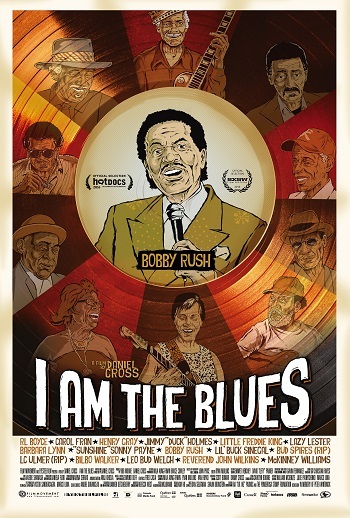 Visit the I Am the Blues website for a full list of screenings. This entry was posted in Movies and tagged Barbara Lynn, Bobby Rush, Bud Spires, Carol Fran, Henry Gray, Jimmy "Duck" Holmes, Lazy Lester, LC Ulmer, Leo Bud Welch, Lil' Buck Sinegal, Little Freddie King, McKinney Williams, RL Boyce. Bookmark the permalink.